Toshiba's lightest ultraportable laptop, the Portege R830, is now available for pre-order from Toshiba with prices starting at a reasonable $890. The much anticipated Portege R830 offers a more affordable alternative to the ultra-thin MacBook Air and Samsung Series 9 laptops. The Portege R830 has a similar form factor as the MacBook Air and Samsung Series 9, with a 13.3" display and a weight of a little over 3 pounds. While it lacks the head-turning design styling of those two ultraportables, the Portege R830 costs about $700 less. * Weight: 3.2lbs. versus the Samsung 9's 2.89 lbs. and the MacBook Air's 2.9 lbs. Besides lower pricing, the Portege R830 does have some advantages or features not found in the other two ultraportable laptops, such as a built-in DVD drive and a longer battery life rating (up to 9 hours versus the Series 9's 6.5 hours and the MacBook Air's 7 hours). An update to the popular and highly rated Portege R700 series of thin-and-light laptops, the Portege R830 also features Intel's second-gen processors, runs Windows 7 Home Premium (64-bit), and comes with 4GB DDR3 memory (expandable to 8GB) and 640GB hard drive space. 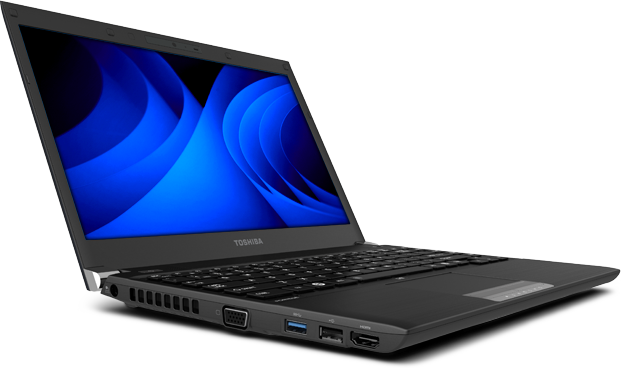 Portege R830 models are available now on Toshiba's Website, and there's a Best Buy exclusive model as well.